TEPCO injecting fresh water into Units 1, 2 and 3; and is using temporary electric pumps for injection (all three units). Actions are underway to pump water from flooded turbine building basements into condensers/other tanks. TEPCO plans to inject water into U-1 SFP from Cement Pumper truck on 30 March. Lighting returned to U-4 control room, however dose rates are preventing access. TEPCO is considering spraying Zeolite on the outside and interior of the Rx Bldgs in an effort to minimize resuspension of fission products in the air but having difficulty planning application due to high dose rates. Highly radioactive water (approx 100 R/hr) found in a “trench” (pipe and cable chase) outside Unit 2; source of water unclear. TEPCO stated that this water is not flowing into the ocean, though the water will overflow this trench if it rises about 1 meter (trench is 4 meters deep). There is water in the trenches outside of Units 1 and 3 as well. Actions have been taken, or are in progress, to preclude contaminated water in trenches from reaching the ocean (e.g., sandbags, etc.). TEPCO is planning to install equipment to inert Unit 1 by 31 March. One train of the Bechtel pumping system is being deployed to the site. Both barges are being moved to the site (10 hr cruise), intending to arrive 30 March (some reports indicate that barges have arrived). Resupply water ship anchored at sea. The GOJ has requested help with shielding, removal of spent fuel, and robotics. The NRC Site Team indicates that TEPCO has contracted with the Shaw Company for decay heat removal systems and debris removal. NEI is collecting U.S. nuclear plant environmental monitoring sample data and has made an online database available for viewing by NRC and other agencies. The RST has provided coordinated (GEH, EPRI, INPO, NR, DOE) recommendations pertaining to severe accident management strategies to the NRC team in Japan. Revisions are being considered in light of suspected Unit 2 and Unit 3 core and containment conditions, and environmental release concerns. NRC continues to recommend inerting containment and controlled flooding of containment, On 30 March the RST plans to assemble experts to assess what possible means for an energetic release of fission products might remain, given the extent of damage suspected to have already occurred. The PMT evaluated information from TEPCO and NISA regarding levels of plutonium sampled on site. The levels (5.4X1 0-1 Bq/kg) are very low, and below background levels applicable to the eastern range of the Rocky Mountains (in the US) and also falls within a range of know plutonium background levels in Japan. 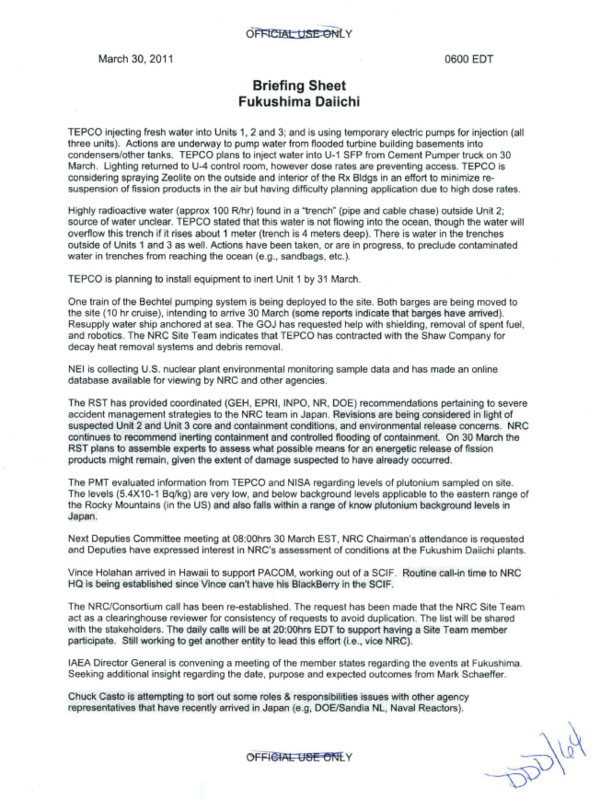 Next Deputies Committee meeting at 08:00hrs 30 March EST, NRC Chairman’s attendance is requested and Deputies have expressed interest in NRC’s assessment of conditions at the Fukushim Daiichi plants. Vince Holahan arrived in Hawaii to support PACOM, working out of a SCIF. Routine call-in time to NRC HQ is being established since Vince can’t have his BlackBerry in the SCIF. The NRC/Consortium call has been re-established. The request has been made that the NRC Site Team act as a clearinghouse reviewer for consistency of requests to avoid duplication. The list will be shared with the stakeholders. The daily calls will be at 20:00hrs EDT to support having a Site Team member participate. Still working to get another entity to lead this effort (i.e., vice NRC). IAEA Director General is convening a meeting of the member states regarding the events at Fukushima. Seeking additional insight regarding the date, purpose and expected outcomes from Mark Schaeffer. Chuck Casto is attempting to sort out some roles & responsibilities issues with other agency representatives that have recently arrived in Japan (e.g, DOEJSandia NL, Naval Reactors).